The Society for Art & Cultural Heritage of India (SACHI) and the Berkeley Art Museum & Pacific Film Archive, with the support of the South Asia Art Initiative at UC Berkeley, are delighted to host a lecture by Artist, Matti Braun on Indian icon, Vikram Sarabhai. This illustrated slide presentation takes its point of departure from the remarkable life and biography of Vikram Sarabhai (1919-1971), best remembered as the father of Indian Space Program. He saw advances in science and technology as crucial stepping stones to making India a Modern nation. A Cambridge University cosmic-ray scholar, Dr. Vikram was much more than a brilliant physicist. A scientist, an entrepreneur, a key institution builder, and a man of vision, Sarabhais ongoing search to innovate led him to experiment in diverse fields as art, technology and textiles. The latter, a family tradition, inspired the housing of its exclusive world renowned collection in the Calico Museum of Textiles, a Sarabhai Foundation enterprise. And together with the renowned classical dancer, his wife, Mrinalini, Dr. Sarabhai, founded the prestigious Darpan Academy of Performing Arts in 1949. 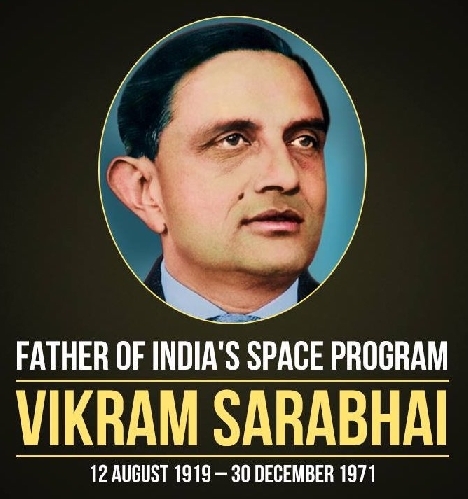 His ability to extend the scope of artistic frontiers while simultaneously emphasizing and nurturing Indias scientific progress  carving and establishing an important space program, and undertaking many pathbreaking endeavors  made Vikram Sarabhai extraordinarily unique. He stood as an emblem of Modernity, a citizen of the world. The presentation traces his connections not only to famed Indian cultural figures as the poet, Rabindranath Tagore, film director, Satyajit Ray, and his wife, the renowned Indian dancer Mrinalini Sarabhai, but also, how Sarabhais work intersects major cultural developments in 20th century India. His global interactions revealed associations with international modernist figures Le Corbusier, who designed a family home in 1951, Louis Kahn, John Cage, Alexander Calder, Henri Cartier-Bresson and more. These artists engaged with him and with members of his influential family of patrons in their home city of Ahmedabad. The artist, Matti Braun spins an elaborate web of interdisciplinary associations around the Indian physicist Vikram Sarabhai. Inspired by some of the cultural developments and momentum of the Modernist movement of Twentieth Century India, Brauns research focuses on, among others, the multifaceted figure of Sarabhai. Matti Brauns slide presentation is created as a precisely composed score of images and words, that reflect the stories through his unique artistic vision and narration. Matti Braun is a Cologne based multidisciplinary and contemporary artist deeply engaged in cross-cultural conversations. He works in a range of media, including painting, photography, and large-scale installations. His diverse projects range from exploring the ancient Silk Route connecting East and West, to taking an expansive look at the Indian physicist, Vikram Sarabhai. Through a process of cultural intermingling, Brauns practice invites viewers to question and expand the discourse on globalization. The artists visually impressive work has been the remaking since 2003 of the installation R.T./S.R./V.S., his signature piece. Matti Brauns art installation at the Rubin Museum, New York, R.T./S.R./V.S. (2003present) constitutes a segment of a 3-part series, A Lost Future which will be on display October 5, 2018-January 28, 2019. It draws inspiration from the first lotus pond scene of Indian director, Satyajit Rays unrealized film, The Alien, and also from the first scene in Steven Spielbergs E.T., which may have been directly influenced by Rays script. The title of the work alludes to two other heroes of Indian modernity: the poet, Rabindranath Tagore (R.T.) and the founder of the Indian Space Research Organization, Vikram Sarabhai (V.S.). Mattis research informs that Sarabhai was an inspiration for the writing of director Satyajit Rays filmscript, The Alien. The artist has shown his work in group and solo shows internationally. The exhibition venues include Museums and Art Galleries in Cologne, Berlin, Helsinki, Zurich, London, Paris, Rome, Dublin, Amsterdam, Devi Art Foundation, Gurgaon, Rubin Museum of Art, New York, and more. Matti Braun shares a special association with the Principality of Monaco. His artwork has recently been included in the collection of the Nouveau Musee National de Monaco (Villa Paloma). He received formal training at the Braunschweig School of Fine Arts and the Frankfurt Academy of Fine Arts.